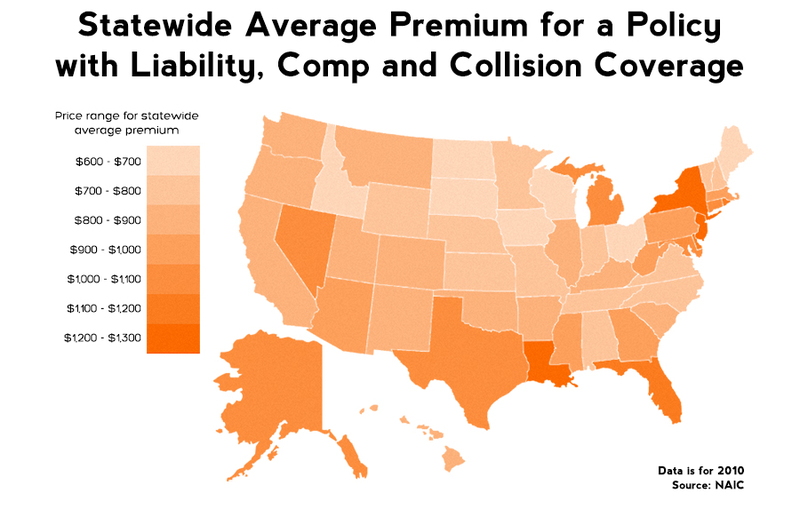 There have been familiar faces high atop listings of auto coverage costs from the National Association of Insurance Commissioners (NAIC), and this year was no different: Washington, D.C., and New Jersey show the second- and third-highest average premiums in the nation, respectively, based on the 2010 data, the most recent from the NAIC. Executives at the insurance departments of both states spoke to Online Auto Insurance News (OAIN) about why there are higher-than-average costs in their parts of the nation. The answer is simple in Washington D.C.—where the average premium with liability, collision and comprehensive coverage in 2010 was $1,277—according to Philip Barlow, an associate commissioner with the Department of Insurance, Securities and Banking (DISB). An urban environment like Washington is unique, as it is “more akin to a city than a state,” according to Barlow. Densely-populated urban areas are magnets for “more congestion, more traffic and more chances for accidents,” according to Barlow. Washington’s average premium is barely above New Jersey, which had the third-highest premium figure at $1,276. The Garden State, though bigger in size than the nation’s capital, also sees population density coming into play with auto insurance costs, according to Marshall McKnight, spokesman for the Department of Banking and Insurance (DOBI). “We are in the most densely populated state in the country, so the loss experience is higher because there are more expensive accidents,” McKnight said in an interview with OAIN. According to the NAIC report, New Jersey, like D.C., has almost all of its residents living in urban areas. New Jersey actually ranked No. 1 for average expenditure, a metric that measures how much residents of a state actually ended up spending on policies. This measurement is influenced by how many drivers in the state end up buying optional comprehensive and collision coverage. If more buy those optional coverages, the average expenditure inflates. According to McKnight, many people who purchase New Jersey car insurance end up buying these coverages. “New Jerseyans tend to buy more coverage and they tend to have more valuable cars. And more of them have more valuable collision coverage and comprehensive coverage,” he said. In actuality, the cost of a policy is likely higher than what the NAIC statistics reflect. That’s because many residents of New Jersey and Washington buy personal injury protection (PIP) coverage, a type of coverage in which an insurer compensates its own policyholder for crash-related losses no matter who was at fault. The NAIC statistics only reflect costs for liability, comprehensive and collision coverage. In New Jersey, PIP coverage is available at $250,000 limits, a choice that 3 out of every 4 policyholders purchased in 2011, according to McKnight, who added that such high limits have run up costs when combined with loose regulation of no-fault coverage. New Jersey has thousands of “procedural codes” governing PIP compensation for certain medical services, and the recent addition of more codes that go into effect early next month should bolster regulation of no-fault coverage in the state, according to McKnight. Washington D.C.’s PIP payments have also produced higher-than-average costs within its no-fault system. According to a 2011 report from the Insurance Information Institute (III) on no-fault systems across the nation, our nation’s capital has the seventh-highest no-fault claim size, averaging $5,395 per no-fault claim. In that listing, New Jersey has the second-highest average no-fault claim size, at $16,331.